It was a full house Wednesday night at the Marysville council chambers as the four candidates running to represent the 10th district in congress made their case to voters. 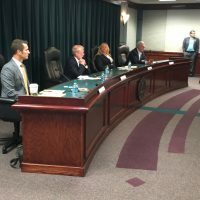 Republican Congressman Paul Mitchell, along with Democratic challenger Kimberly Bizon, Green Party candidate Harley Mikkelson, and independent Jeremy Peruski answered questions from Marysville Mayor Dan Damman in front of a packed audience. Green Party candidate Harley Mikkleson criticized defense spending and called for a single payer health system. On the topic of guns, Mikkleson stated, “We have more guns in this country than any other country.” Specifically, Mikelson said, “Nobody needs them except soldiers and police officers,” when mentioning semi-automatic and handguns. Topics for the forum were prepared by Damman along with students in Marysville’s Advanced Placement Government class. Topics included healthcare, immigration, and tariffs. Full audio of Wednesday’s congressional forum can be found below.